NAFCC Accreditation is quality, commitment, and excellence. NAFCC sponsors the only nationally recognized accreditation system designed specifically for family child care providers. Accreditation is awarded to family child care providers who meet the eligibility requirements and the Quality Standards for NAFCC Accreditation. Family child care providers achieve this high level of quality through a process that examines all aspects of the family child care program, i.e. relationships, the environment, developmental learning activities, safety, health, and professional and business practices. 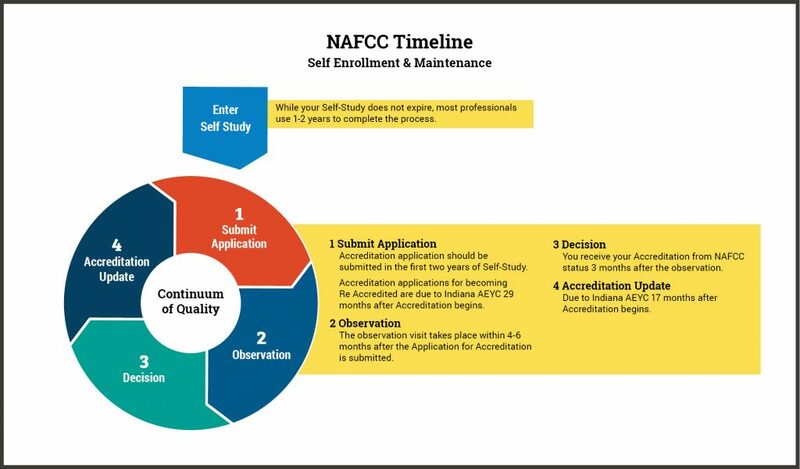 Below you will find more information regarding the steps for becoming and maintaining you NAFCC Accreditation. Just identify where in the process you are, follow the arrows, and review the information for each step to the side. 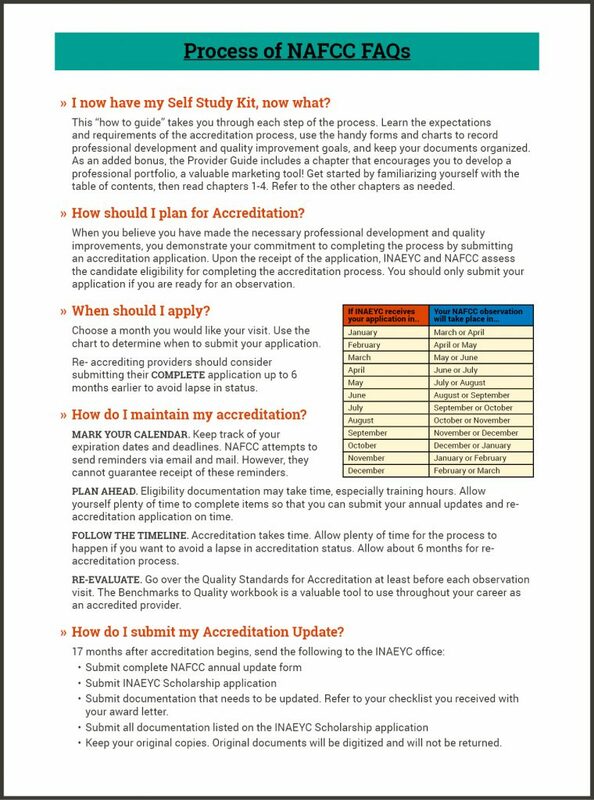 The At-A-Glance publications created by NAFCC give you a wealth of information regarding the expectations for each step of accreditation. Identify your current step of NAFCC accreditation and read all about what you need to do NOW. Then identify your NEXT step and begin preparing. Click on the images below to enlarge and print. 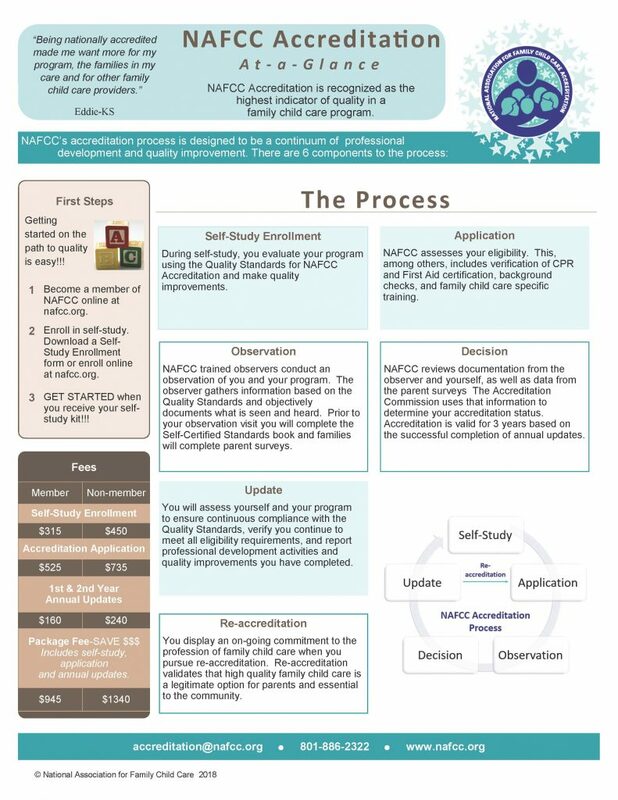 During self-study, you evaluate your program using the Quality Standards for NAFCC Accreditation and make quality improvements. The NAFCC Application stage assesses your eligibility. This, among others, includes verification of CPR and First Aid certification, background checks, and family child care specific training. NAFCC trained observers conduct an observation of you and your program. The observer gathers information based on the Quality Standards and objectively documents what is seen and heard. 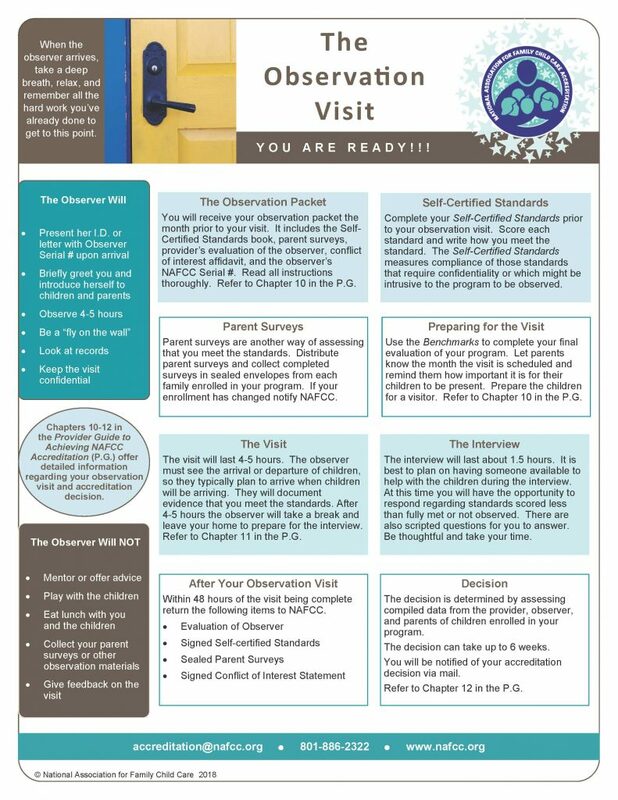 Prior to your observation visit you will complete the Self-Certified Standards book and families will complete parent surveys. You will assess yourself and your program to ensure continuous compliance with the Quality Standards, verify you continue to meet all eligibility requirements, and report professional development activities and quality improvements you have completed during the year. Below you will find a few questions and answers that are often asked regarding NAFCC Accreditation. One of the most important things you can do when seeking or maintaining your accreditation is have the appropriate and most up-to-date version of the necessary paperwork. 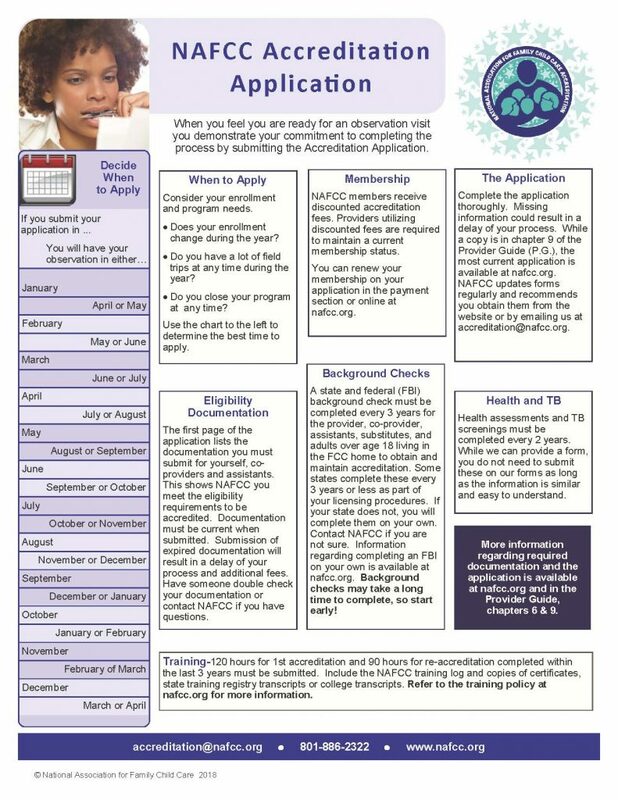 Applications for all steps of the NAFCC Accreditation process can be found on the NAFCC website at www.nafcc.org by hovering over the Accreditation tab and choosing Achieving and Maintaining Accreditation, as seen below. Having trouble with the paperwork? To assist with completing some of the forms within each step of NAFCC Accreditation, we have provided some short How-To videos below. If you still have questions, need guidance, or the form with which you need assistance is not represented, we recommend you contact the appropriate NAFCC representative. Just call (801) 886-2322 and use the appropriate extension. 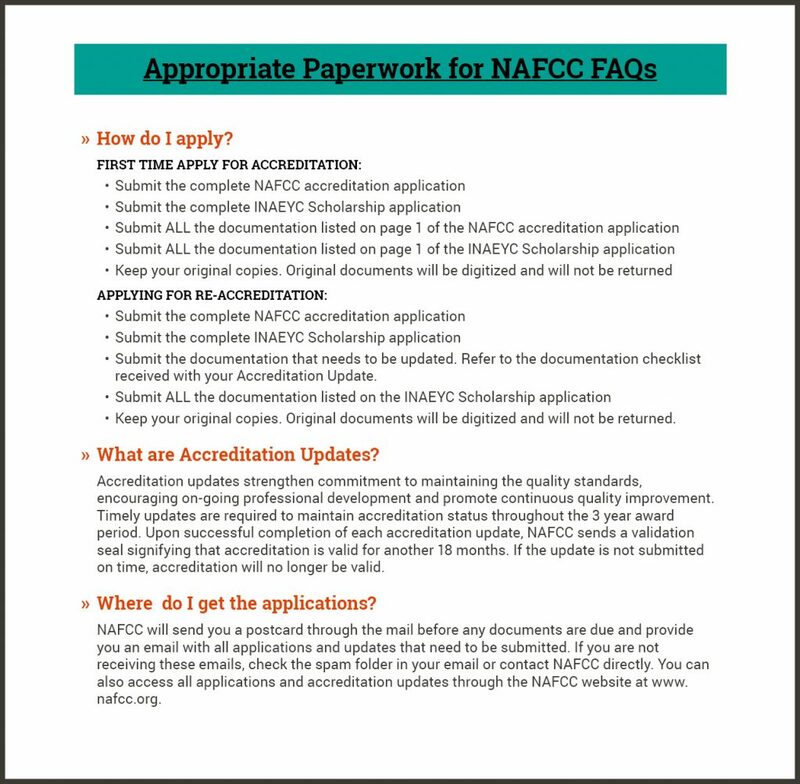 These short videos can assist with forms required for the Accreditation Application step of the NAFCC Accreditation process. These short videos can assist with forms required for the Annual Update Year 1 and Year 2 step of the NAFCC Accreditation process. Below you will find a few questions and answers that are often asked regarding the required NAFCC Accreditation paperwork. 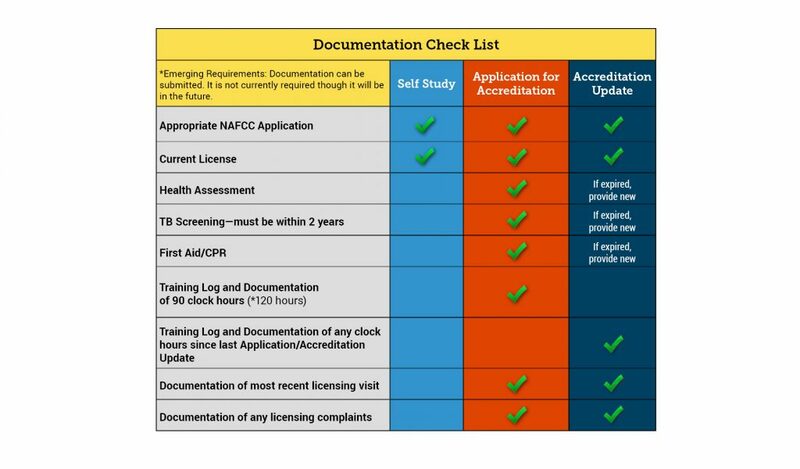 Every step and of NAFCC Accreditation process requires some supplemental documentation to be sent with the appropriate paperwork. 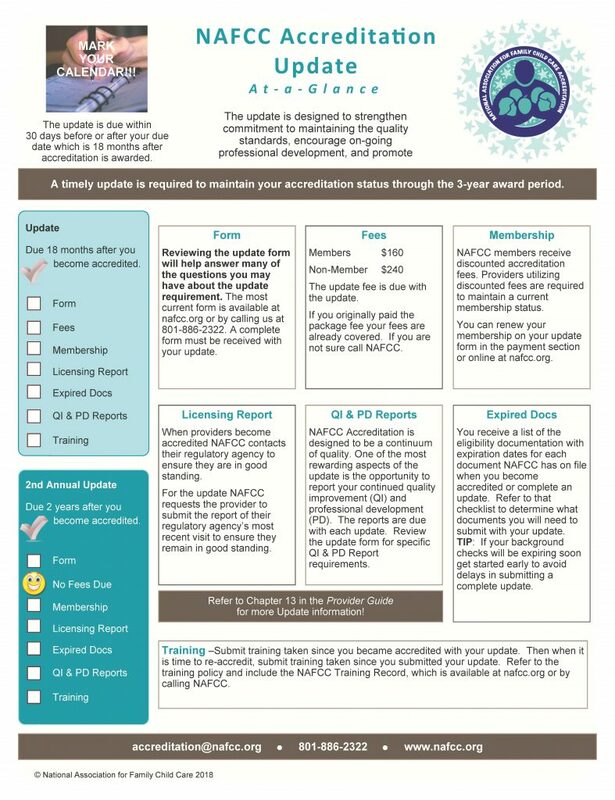 The table below gives a snapshot of the documents that you may need to send for each step of the NAFCC Accreditation process. Note that this table does not include ALL eligibility documentation found on the first page of the Accreditation Application. We understand that gathering all the needed certificates, transcripts, and other documents can be difficult. Applying all of these documents to the appropriate form can also be confusing. If you are having trouble completing the NAFCC Accreditation Training Log, watch the short video below. If you still have questions, we recommend you contact the appropriate representative at NAFCC using the contact information in the NAFCC Accreditation Paperwork section of this page.